Canela is an almost all-female band (save for saxophonist Jesús Fuentes) founded in 1989 by general director Zoe Fuentes Aldama. The members are clasically-trained graduates of various universities in Cuba who also play Latin Jazz, Salsa, Son, Timba, Zouk, Reggae and other Caribbean styles. 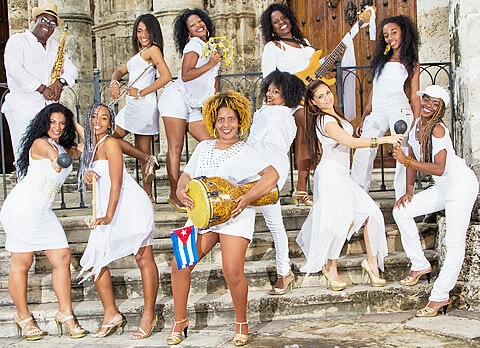 They have performed extensively throughout Europe, Asia, Africa and Latin America and have shared the stage with artists such as Chucho Valdés, Steve Turre, Phil Collins, Herbie Hancock, Los Papines, Miriam Makeba, Los Comodores, Danilo Pérez, David Sánchez, Michael Brecker, Cesaria Evora, Alfredo de la Fe and Orquesta Aragón among many others. Somehow this dynamic and versatile band has managed to stay off the radar of presenters in the United States until recently. It is time for someone to correct that oversight. See the sub-pages for a discography, some sound clips, more videos and more.